suggested how those who had lost their lives in the Second World War might be commemorated. Mr. Stanley Deaves, Mr. Webber and Mr. Drake, was appointed to obtain estimates for the addition of the names and for the necessary repairs. It took another four months, for the sub-committee to propose that two new tablets be provided, one to list the names of those who died on active service and one to bear the names of those who were killed in the village as a result of enemy action. Watts Stonemasons of Colchester quoted £16/10d. for supplying and fixing the tablets plus 10/- per dozen letters to be cut. funds to cover the cost of this work. so a second appeal was mounted. Realising that the full amount of £40 was unlikely to be raised, both St Mary and Hamlet Parish Councils agreed to cover any losses incurred. 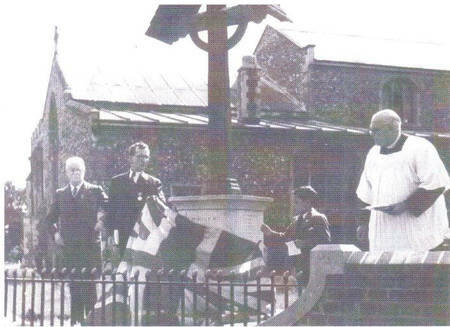 The British Legion were authorised to supervise the unveiling of the new plaques, which should form part of a church thanksgiving service. Grade 2 listed building status.